She was first at many things—first woman admitted to MIT, founder and first president of the American Home Economics Association, first water quality chemist for the state of Massachusetts. She also was the first person to introduce the word “ecology” and its central concept into the scientific establishment of the United States. Ellen Henrietta Swallow was born in Massachusetts on December 3, 1842 (died 1911). Her family was poor, and so Swallow did not attend school as a girl. Eventually she attended a teaching academy for two years and became a school teacher. But science and research haunted her, and she entered Vassar College in 1868, at the age of 26. She received a degree in two years and then started breaking barriers. She sought admission to what we call today the Massachusetts Institute of Technology (MIT), then an all-male school. 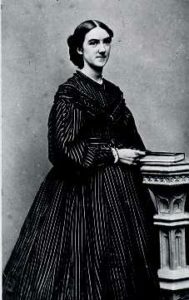 They admitted her on her birthday, 1870, with the understanding that this was not the start of a new policy, but as an experiment to see if women could succeed at a scientific school. She was, thus, the first female student to attend MIT and the first to attend a science-based university in the U.S.
Ellen Henrietta Swallow in 1864, at age 22. She handled it just fine, graduating in two years with another bachelor’s degree and a master’s degree from Vassar (MIT refused to issue advanced degrees to women for several more years). She immediately went to work as an unpaid instructor in chemistry—again the first (or perhaps the second) female chemistry teacher in the land. Within a few years, she raised the funds and the backing to open the Women’s Laboratory at MIT, a mechanism to allow women to study science without being fully admitted into the school, bypassing the men-only admission policy. During the 1880s she began working on water pollution issues in Massachusetts, again among the early leaders of sanitary chemistry. Now under her married name of Ellen Richards, she implemented a comprehensive survey of water quality across the state, testing water samples from more than 20,000 sites (some sources say 30,000 or even 40,000)—a first in both scope and organization. She established a natural baseline for chlorine in water, graduated from coastal to inland locations, to use as a standard for judging the amount of local water contamination. Her work led to the first Massachusetts statewide water quality standards and the state’s first modern water treatment plant (and, of course, the first of both in the nation). Richards was committed to the idea that science was useful—essential, really—in organizing normal life so that it was healthy and efficient. The concept was based in the ideas of ecology, then being developed in Germany. She introduced both the concept of ecology and the term into English (she first spelled it “oekology”), the first in the country to do so. Hence, it is appropriate to consider her as one of the founders of the science of ecology. Her viewpoint that a healthy environment created healthy people and a healthy economy is an early representation of the modern concept of sustainability. Ellen Richard Swallow, circa 1900 ( Frontispiece from The Life of Ellen H. Richards; by Caroline L. Hunt; 1912). Richards is remembered today mostly as the founder of the science of home economics, which she termed “euthenics.” Although her term never caught on (it was too easily confused with eugenics), her principles have remained and grown into the science, teaching and extension of food safety, nutrition, and sanitary practices to the general public. She co-founded the American Home Economics Association and served as its first president until her death in 1911. Encyclopedia Britannica. Ellen Swallow Richards, American chemist. Available at: https://www.britannica.com/biography/Ellen-Swallow-Richards. Accessed November 28, 2018. Massachusetts Institute of Technology. 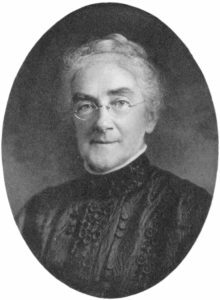 Ellen Swallow Richards: Biography. Available at: https://libraries.mit.edu/archives/exhibits/esr/esr-biography.html. Accessed November 28, 2018. Science History Institute. Ellen H. Swallow Richards. Available at: https://www.sciencehistory.org/historical-profile/ellen-h-swallow-richards. Accessed November 28, 2018. Vassar Encyclopedia. Ellen Swallow Richards. Available at: http://vcencyclopedia.vassar.edu/alumni/ellen-swallow-richards.html. Accessed November 28, 2018.